And if you don’t have any tapes left, you can also listen to your CDs or MP3 songs straight from your flash drive, iPod, MP3 player or even your computer, thanks to the included USB port. The MAJ-U02 speakers have a bass reflex system, an amplifier with bass boost and a digital audio out connection (optical). 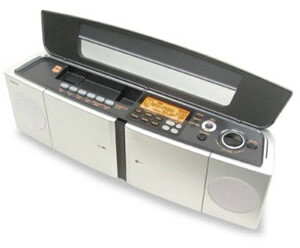 Gadget Garden has made a very funny video about this Boombox, check it out here, even if you don’t understand a word of it, since the video is in Dutch. If you’re into all that retro vibe, you can buy the Sanyo MAJ-U02 for £104.98 at Amazon.